Hub on Campus Tuscaloosa, or “the Hub,” opened its doors in August 2018 with promises of the convenience of living near campus, but elevated by luxurious living arrangements and top-notch amenities. The eight-level, 276,700 square-foot complex sits in the shadow of Bryant-Denny Stadium on Red Drew Avenue and houses 187 units. While its Instagram page looks like a promise for a good time – giveaways, catered events, pool parties and the like – students say living at the Hub is not all it seems to be. AJ Spurr, a sophomore majoring in news media and political science, shared a similar experience regarding move-in and the state of his sixth-floor suite. “When I first arrived to my room, I was met with a lot of construction-related dust on the floors, minor holes in the walls, unset floor panels, water damage on my walls/roof in the bedroom and a Juul pod stuck into a USB wall outlet,” Spurr said in an email. Spurr said the move-in process wasn’t terrible, but one he “definitely did not enjoy,” as he was disappointed for being sold on a brand new, luxurious living facility that ended up being more like a construction zone. For resident Kelly Hoffman, the experience was almost identical. At this point, Halberstadt, a junior majoring in operations management, and his roommates are well-acquainted with maintenance issues at the Hub. From backward wiring to missing outlet covers and kick plates upon move-in, Halberstadt has not been happy with the Hub from day one. And after dealing with sewage floods and water floods from the amenities next door to their unit, the quality of work being performed at the Hub is questionable. From the very beginning, students say the Hub was simply not ready to be opened. Spencer Baumruk, a sophomore majoring in finance, math and economics, said after he navigated the “carnival” that was the Hub’s move-in process, his room resembled yet another construction site. Beyond this, Baumruk said the appliances were not what was promised, the rooms itself were significantly smaller than they anticipated, and the furniture that was included broke several times over the past seven months. A major incident occurred when Baumruk and his roommates arrived home at around midnight to find that their key fobs would not unlock their front door. After they requested help from a representative on the 24/7 helpline, they waited over an hour with no assistance. Being on the sixth floor, which is the top floor of the complex, the locked-out residents decided to dangle one of the roommates over the roof of the complex and drop him onto their balcony, which had an unlocked door. Baumruk said Cook, the property manager for the Hub, showed up to assess the locks shortly after everyone got in. Seven months later, other issues continued to surface. Halberstadt and his roommates have been displaced at least twice for flooding in their apartment. 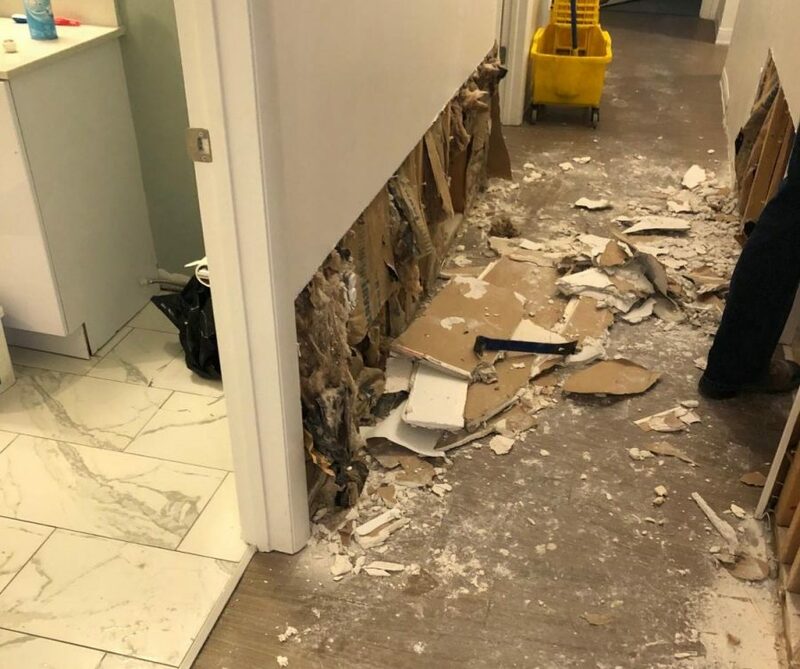 The Hub covered the bill for their stay at Hotel Capstone while the repairs were being made, but Halberstadt said they were still required to pay rent during their time away. Hoffman, a sophomore majoring in marketing, said she also faced many of the issues that her neighbors mentioned upon move in. She has also dealt with sewage flooding her apartment. For her, the deception from the company is what hurts the most. Hoffman believes the Hub’s parent company, Core Spaces, should have waited to begin move-in. With problems with maintenance, security, communication and everything in between happening on a consistent basis, she isn’t confident the Hub’s opening should have been approved in the first place. A few months ago, an email was sent out to the parents of Hub residents from Humble Law, an employment and consumer attorneys’ office based out of Vestavia Hills, Alabama. Baumruk said lawyers have been collecting individual complaints with plans to sue the city of Tuscaloosa for issuing the permits for the Hub and the Hub’s management for false advertising and fraud. Dozens of students and their parents are participating in the lawsuit. “They’re just trying to gather as much information and then work with the Hub’s lawyers and the city of Tuscaloosa and just try to get compensation or whatever for everything we’ve been through,” Hoffman said. Becci Hart, a public relations official for the Hub, acknowledged issues with flooding from the amenities but said they were quickly rectified. She denied the Hub having any security issues – another problem mentioned by residents. Spurr disagreed with the statements issued by Hart, as he mentioned the absence of security guards at multiple posts around the complex one night when he was locked out of his room. Beyond that, two videos have surfaced showing two different men (presumably maintenance workers or Hub staff) entering and poking around a different resident’s bedroom. The evidence was caught on a surveillance camera the resident set up, and it was posted to the Hub parents’ Facebook group. The mother of the resident said she did not know who these men are or why they were looking at the contents of the resident’s desk. The lawsuit is still ongoing, with members of the Facebook group receiving updates a couple times a week. Attorneys are still gathering data related to impure air, unannounced intrusions, faulty plumbing or electrical work, problems with Hub staff and more. It has not been revealed if residents will receive compensation of any sort for their living conditions. Halberstadt said there is one thing the Hub is good at doing, and that is deceiving its potential residents. He said it is beyond him as to how leases are still being signed for next year, but Halberstadt said the advertising on social media and during tours is nothing but a dupe. During he and his roommates’ worst maintenance spells, Halberstadt said there was “total incompetency” between the Hub’s management and the hotels they were staying in. During their most recent displacement two weeks ago, the roommates had to check out of their room three times because of improper bookings. Spurr, who was promised VIP luxury in his sixth-floor suite, could not have been more disappointed since he moved in. While he is upset with the way residents have been treated in the past seven months by management, he stressed that the middlemen not be blamed. While Hoffman agreed that office staff often do not have a say in the overarching problems found at the Hub, her frustration over these past seven months has led her to find an alternative living arrangement than the one she has now. In the nick of time, Hoffman’s sorority house has a vacancy with her name on it. But for those considering moving into the Hub, she offers a warning. The Crimson White reached out to the Hub’s property manager, Nathan Cook, who declined to comment. Attorneys of Humble Law were unable to comment at the time of publication.